As a beginner, a lot of things are going on in your mind while buying your first skateboard… Right! Same happened to me when I had to buy mine, back in 2009. So what I did was just what any beginner does and certainly regrets in the end. I just went into a store filled with all that excitement of getting my first ever skateboard, looked into a few and without having any knowledge of what actually to look in a skateboard, just fell for the looks. This is the mistake most of us do, we buy a skateboard that looks cool without even considering what’s the right size of the skateboard for us, which wheels should we be choosing as a beginner and what are the specs to pay attention battery time, power, top speed and a lot goes into account. 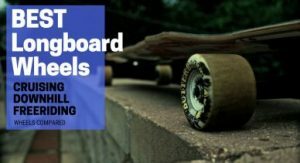 So today I’ll be lining up the 7 best skateboards for beginners that I have researched & reviewed myself and that are best for a beginner, just like you. So let’s just get to it. First of all, we need to know a little about the components/parts of the skateboard that is necessary and don’t worry I’ll be just covering the basics to get you started with skateboarding. Size of the board really matters in the riding experience. Either doing mid-air tricks or going around a curve, size of the board matters. 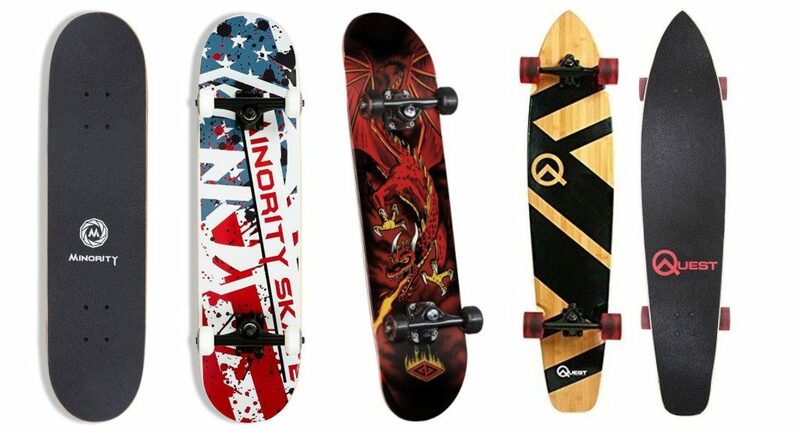 Most of the standard skateboards are between the range of 7.5” x 31”- 8.5” x 32.5” (width x length × height). For a beginner, you really need to feel stable once you are riding on your board. Most of the skateboards are 8 inches wide, but if you have larger feet, you can get one that is a bit wider. But, I’ll suggest that you should go for a board that is no wider than 8 inches, the lesser the width of the board, the better the grip over your board and hence, the better the riding experience. Moreover, for young kids under the ages of 5-7 a skateboard of size 7” x 28” is ideal. And for kids between the age of 8-10, a skateboard of 7.25” x 29’’ size is recommended. Now, we need to look into the deck of the skateboard. Decks are typically wooden or plastic. Wooden skateboards are the most popular among skateboarders. Plastic boards also called as Penny Boards might seem like a child’s toy but plastic boards are relatively affordable and surprisingly durable too. Still, I’ll recommend getting a skateboard with a wooden deck, any day. Choosing a skateboard that is made out of good, sturdy, and durable wood is vital. As the deck will be taking all the beating when you fall off or start doing tricks. Most of the time it’s the Canadian Maple Wood that is preferred in decks. On top of the wood, skateboards have a grip tape to maintain the grip between your shoes and the board. So look for some material that is of high quality and what will prevent your shoes from sliding off the board. Standard or default grip tape works fine for beginners once you get good in riding you can change or customize it according to your needs. The next thing to inspect is the shape of the board. Most of the standard skateboards are concave (the tail and nose of the board are slightly raised). It’s made concave to allow riders to perform kick tricks. The more the concave, the better it is to perform flip tricks than one that has no concavity because the riders foot wouldn’t grab the board & it becomes difficult to perform tricks with a flat board. Longboards are usually completely flat that make it better for cruising. So those who aren’t interested in skateboard tricks should opt for a longboard. In my point of view, a skateboard with moderate concavity is a go-to for a beginner, what’s the fun without the tricks. The trucks that you use depend upon the width of the deck. If you have a wider deck, you’ll need wider trucks to make your skateboard more stable & steady. If narrow trucks are used, you can expect the skateboard to be wobbly and hard to balance on. The bushings on the board also play a vital role. If the bushings are too firm, you’ll have a more stable ride, but making bushings firm also makes it harder to turn. On the other hand, soft bushings are much more responsive, but again you do lose a bit of stability. So if you don’t know if your skateboards bushings are either firm or soft, you likely have the default bushings that are soft. Wheels are the most important part of the skateboard. Why… Let’s get things straight. The skateboard wheels diameter effects the speed, the larger the wheels, the faster your speed & smaller the wheels, the slower your speed is but skateboards with small wheel diameter are good for tricks as the skateboard will sit closer to the ground. And wheels with a large diameter, add stability and you will have an easier time controlling the skateboard (preferred for beginners). Now when it comes to the hardness of the material of the wheels, Soft wheels are better for riding on uneven surfaces but hard wheels help you perform tricks. I personally use harder wheels of 100A levels which give kind of a ‘’pop’’ for tricks. The price of the board depends upon the skateboard brand and the build quality of the board. A good skateboard for beginners ranges from $40 to $ 300. Personally, I wouldn’t suggest you go overboard and spend all your money on an expensive board. It would be better to buy a skateboard that would cost you less than $150. Well, your skateboard is definitely supposed to make you look cool. What’s the point if you don’t like the looks of your skateboard? For me, it’s as important as other features of the skateboard. So I’ve combined for you, the best skateboards that are not only best in their features but also in their looks. 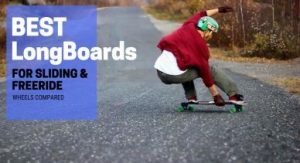 Now, let’s get to what you all have been waiting for, and yes that’s the list of the 7 best skateboards for beginners. It’s not only an optimum board for a beginner having no skateboarding skills but also for the intermediates. Powell Golden Dragon has some excellent build quality and good value for money. The most distinguishing feature in the build is the extra polymeric strap that’s used rather than using three straps in the original ligament. What it does is that it holds together the deck when there’s a crack, preventing the board from breaking into two pieces. So, adding that extra support to the deck provides safety to the rider as well as durability to the board. The other distinguishing feature is the hand-cast polyurethane wheels. That gives you high-rebound and offers the best roll and amazing grip while riding. The Powell Golden Dragon is an aesthetic beauty. The unique look that embraces the feel of fiery dragons and cool graphics is for sure gonna grab some attention. Powell Golden Dragon is a solid board that is 31 inches long (31.625 inches), the width is about 7.6 inches, and the deck shape is 126. The size of the wheels is about 54mm by 37mm. The Golden Dragon has a soft truck bushing, which means it’s a bit more responsive to weight distribution. That is why it will be good for intermediate riders who are familiar with the controlling of a skateboard. As for beginners who are still learning and may not be familiar with controlling the skateboard it might not be that much convenient. Either way, it’s a win win for such a reasonable amount of cash, and you will get along with it easily. I’m personally a huge fan of the MINORITY 32 inch board. It’s just perfect for a beginner, wide enough to feel completely in control. The skateboard’s deck is made from 100% Maple which makes it the most premier quality deck in the market. It’s 7-ply hard rock maple makes it extremely sturdy and durable, allowing it to hold a weight of up to 220 lbs. 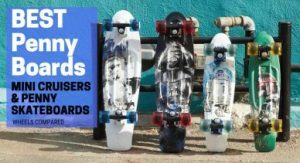 This board should be on your list if you’re looking for a skateboard that is best for pulling off some tricks or if you are looking for a skateboard which is best for carved out turns or with sharp maneuverability. The shape of the deck is medium concave, with a kick tail and nose. The most distinguishing feature is the 5-inch trucks which are cast by genuine aluminum alloy, equipped with carbon steel kingpin and 78A high rebound PU bushing. This makes it ideal for anyone who is either starting out or is a pro making it ideal board for ramps, pools or just cruising through the street. 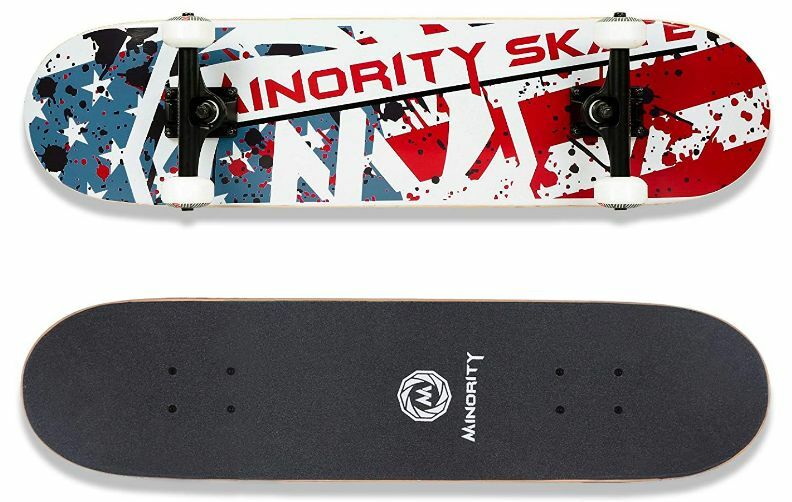 MINORITY 32inch Maple Skateboard comes in a variety of styles and artwork. Ten different designs are available to be exact. It’s classic, cool and aesthetically engineered. If you want a board that performs as good as it looks MINORITY is the one. As the name says it’s a solid 32-inch long maple deck with a width of 8 inches. The bearings used are the ABEC-9 precision bearings that are forged by chrome steel. 52mm 102A PU wheels are used. Tip: Remember Fast speed is half success for tricks. The only downside of this MINORITY Maple Skateboard is that it’s not a flexible board (as it’s a 100% Maple deck) which means it’s a little harder to ease into turns. But this feature is what will help a new learner become a pro one. As the name suggests the brand focuses on the positive and energetic side of skateboarding. Behind the success of POSITIV Team Skateboards are Andy Macdonald, Rodney Jones, and Sandro Dias. They came with a vision to manufacture high-quality skateboards for all levels of skateboarders. So POSITIV Team has a skateboard for you either you are a beginner or a pro skateboarder, they’ve definitely got everyone covered. POSITIV Team Complete Skateboard is a trick oriented board. 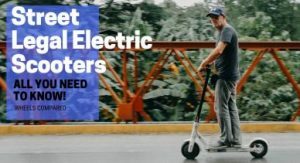 The best feature is its high-gripping wheels that are best for tricks allowing you to move pretty easily on slippery surfaces without falling off & hurting yourself. Trucks of this skateboard are mounted at a good height, and this positioning is what is lacking in many skateboards. Due to flawed positioning and design, many boards split and crack as the result of grinds, ollies, and kickflips, especially if you don’t land on the bolts. But this one has been made perfect considering this aspect. This board uses an AirLam press that fuses several piles of wood together in order to gain a high level of durability. The wood is then bound together using strong waterproof glue. POSITIV Complete Board is made up of maple wood of great quality. This makes it highly durable and able to take up the beating with ease and without breaking into two. Under the deck, a layer of SST slide treatment is coated. This is designed to improve the length of your slides, which is a very robust & distinguishing feature of this board. It has some great features that make it stand out from the crowd. I personally really love the signature POSITIV design & squares configured into crosses. And on the deck, the POSITIV cross logo really makes it whole on the design department. The board is about 32.1 inches long, and the width is 8 inches to be exact. The skateboard deck shape is 127. The wheels themselves are about 54 mm by 37 mm and hardness of 99A. If you are looking for a board that has a lot of far-out designs options, then this isn’t the skateboard for you. Other than that what I noticed was the underside of the board tends to scrape fairly easily. This doesn’t for sure damage the board itself, but the paint might get scraped off. Still, its maneuverability is what keeps it on the list. As the wheels have a great level of grip, I found this actually one of the easiest to maneuver and easiest to control skateboards. So for that, it’s one of the best skateboards for beginners. Penny boards are all about the ease and portability. They are lightweight and small, so you can fit them anywhere in your backpack or carry them on your commute, to school, or anywhere you go. The Classic Complete Penny board comes in the 22 inch and 27-inch sizes. It’s made up of lightweight plastic yet is extremely durable and can easily carry a weight of 182 lbs. 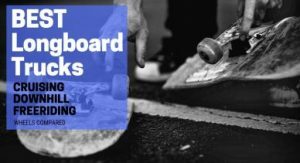 The skateboard has a rock solid deck with waffle-top on the deck so that you have grip & stability when you are either cursing or showing off a few tricks. People love penny boards for their graphics. 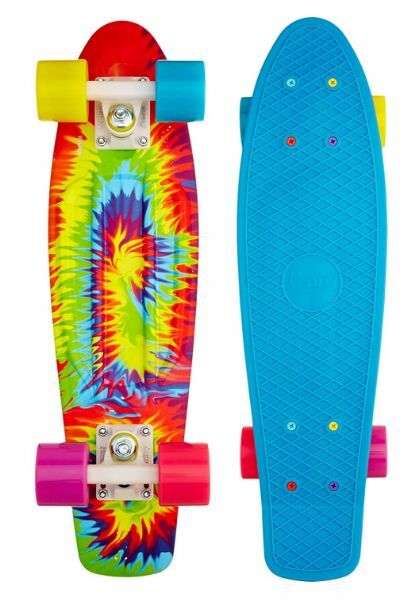 This particular penny board has 12 different designs to choose from. The deck is somewhat small (Somewhere around 22” Long x 6” Wide Decks) than the standard skateboards. Other than this, I gotta say it’s really fun to ride on, and yes it’s longer than the other skateboards too. If you’re just interested in commuting and want something portable, these penny boards are just for you. 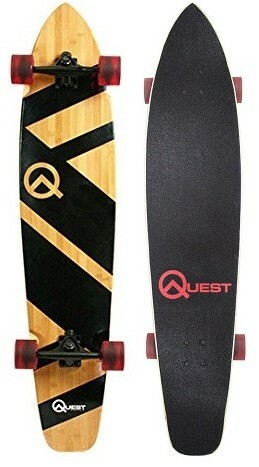 The Quest Super Longboard is the first choice for longboard beginners. It’s affordable, looks super cool and the high build quality just makes it any beginner’s choice. I personally have got this one in my garage with a few customizations. So if you are a beginner and just wanna cruise around the street or need a board to get you around, this is the perfect one for you. The Super Cruiser is sure to up the fun factor in your daily commutes. As a beginner, the long length of the board provides a stable platform to stand on, and you will easily notice the effects of different foot placements. The deck is made with premium Multi-ply Maple Hardwood that makes the board more durable and stiff allowing it only to bend slightly which prevents the board from cracking or splitting into two. The board comes equipped with Genuine ABEC 7 speed bearings and a 7-inch aluminum truck which gives the board its smooth yet thrilling ride. It can be either freeriding or riding downhill it is undoubtedly one of the best skateboards for cruising. And the value for the money you are spending is just off the roof. 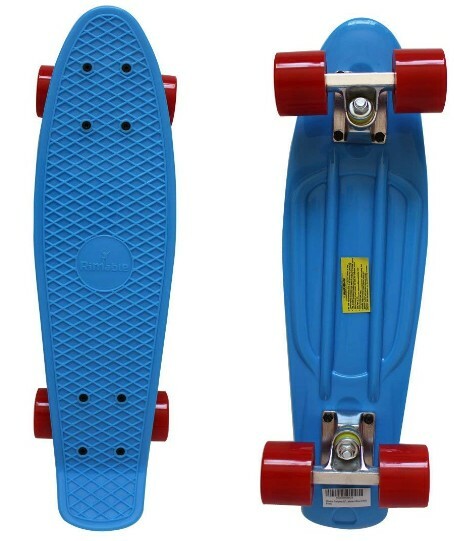 So, better get this one as it is my personal recommendation if you are into longboards. It’s quite rare for a longboard to have this much extra detailing and that too at a reasonable price. The Super Cruiser is 44 inches long and has a width of 10 inch which provides extra stability and ease for a beginner to balance. The Deck has a clearance of 5.5 inches from the ground, and the board weighs around 10 pounds. Polyurethane wheels of 70mm x 51mm size are used, and the hardness is 80A. It’s a little wobbly in the start, only for beginners but as you get used to it, you’ll gonna love it in everyday commute or just getting around. Other than that you’ll need a bit of force to accelerate as compared to a standard skateboard. If you are looking for a skateboard that is very stable, something to just get the feeling of riding without any danger then Atoms is perfect for you. The deck is closer to the ground which makes you more in control and more stable when cruising around. Also, Atom Drop Through Longboard might seem a bit expensive than the Quest Super Cruiser but the features it offers are just too good to be ignored. It’s the most complete board for a beginner. Atoms got some distinguishing features that are present only in the expensive boards. It comes equipped with a fully maple laminated deck that makes it sturdy and durable. Premium quality ABEC 9 bearings with high-speed lubricants are installed providing sufficient durability and maximum speed. A Reverse King Pin (RKP) and longboard trucks with 245-millimeter axles are used. The board is also known as ultra-low riding longboard. This provides the extra stability and is ideal for downhill carving. That is why Atom Drop Through is a total beast to ride. Atom Through Deck comes with laminated maple deck with some stunning and eye catchy graphics. It grabs everyone attention for sure. It follows a trend of black and green with Atom logo. There aren’t any other designs available that I would surely like. The Atom Drop Through is 41.7 inches long and 10.6 inches wide with a ground clearance of 4.7 inches. The weight of the board is 9 pounds. 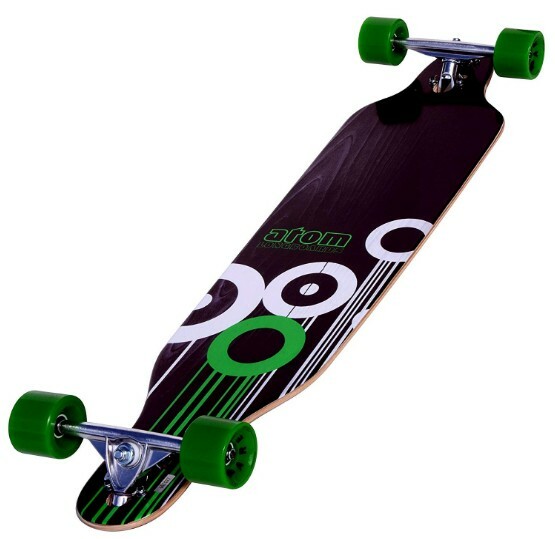 Super high rebound (SHR) Urethane wheels of 70mm x 46mm size are used, and signature atom shape of the board gives leverage of 9.6-inches into every turn that eliminates wheel bite. To be honest, I couldn’t find any cons in the Atom Longboard. This is why they give a one year warranty because the build quality and the performance of the board is just off the roof. I would call it a good bargain for the price with all the premium features on the table. Rimable is for kids, teenagers or for a person that is looking for a skateboard, to begin with. And if you really want good value for money then Rimable Complete 22″ is the one. The original Penny Boards are a bit expensive; Rimable is the alternative for this fraction of the cost. The value for money is the most distinguishing feature of this board when the Original Penny Boards are around $80 to $240 you can get this one under just $40, which is insane! RIMABLE is a mini plastic cruiser, with excellent build quality and waffle top deck that gives stability and grip to the rider. The solid 3-inch aluminum trucks help greatly in the maneuverability of the board. That’s why it’s an ideal board for young kids as a beginner. There are no limitations in the designing department it has 25 different designs to choose from. Either you want a simple one, or something that is eye catchy RIMABLE has got you covered. My personal favorite is the Galaxy and Graffiti designs. As the name , Rimable is a 22 inch long Penny board with a width of 6 inches. Super Smooth PU Wheel of 59mm size and hardness of 78A are used with premium quality ABEC 7 bearings with high-speed lubricants. There’s not much to the cons, but if a variation of sizes were given between 22 inch and 27-inch RIMABLE, it would have been quite suitable for adults too. So for a beginner young adult, I wouldn’t suggest it because the deck is small and it might give you a hard time balancing. If you really wanna go for a Penny board go for a 27 inch Penny Australia Classic Complete Skateboard listed above. For kids and teenagers, it’s the best choice out there and you better not miss this one as it’s cheap and value for money is just insane. Now it’s really up to you to choose a skateboard. It will greatly depend on the style or what kind of skateboarding you want to perform. So you gotta ask yourself in order to find out the right one. Do you want to go cruising around on mostly flat areas for fun? Then, a longboard would be the best choice for you. Or you are interested in freestyling and learning tricks and stunts? Then, a standard skateboard would work best for you. And if you really aren’t sure about the style you wanna adopt, you can go for any of the standard skateboards listed above. So, when you get along with skateboarding, you’ll know exactly which style best suits you. Tip: If you’ve never been on a skateboard it’s better to choose the skateboard that has a wider deck. It will help you maneuver smoothly and easily.